Processing of useful products from waste is achieved by Integrated Waste Management (IWM) which is the most important approach for the management of wastes. Rather than incurring the costs and risks of managing waste, it has been recognized, it is better to reduce the generation of waste. A waste minimization approach is outlined, in order to save costs and greatly minimize environmental liability. The major technique for waste management is recycling, though recycling and use reuse are the two major techniques for waste minimization, the options must be carefully evaluated. In the chemical industry, recovery of solvents, metal values, lubricant and oils has proven particularly cost effective in many countries. There are many such products processed from industrial and agricultural waste like silicon from rice husk, caffeine from tea waste. Here we are going to describe the waste management options and risks of hazardous waste and technologies related to it. Integrated waste management approach is one of the essential components of any successful waste management programme to control hazardous waste. Hazardous waste management is a new concept for most of the Asian countries including India. The utilization of resources and generation of waste is for beyond the limit that the biosphere was made to carry. This book basically describes about the waste management options and technologies for the treatment and disposal of hazardous waste, economic policies and analysis in effluent treatment and financial constraint, municipal waste water treatment and energy recovery, cogeneration: a technology in waste reduction, utilization of industrial wastes in cement manufacture, quality and stability factors in composting, environmental legislation and enforcement mechanism etc. We have made a sincere effort to bring out this book which is a key to the goldmine which can be obtained from waste. For the conservation of our environment and sustainable development, we have tried to bring about the solution. This book is a careful attempt in bringing together some selected articles from both entrepreneurs and specialist on all that is possible in the field of waste management. Integrated Waste Management (IWM) is the most important approach for the management of wastes. Rather than incurring the costs and risks of managing waste, it has been recognized, it is better to reduce the generation of waste. A waste minimization approach is outlined, in order to save costs and greatly minimize environmental liability. Here we are going to describe the waste management options and risks of hazardous waste and technologies related to it. Technologies for the treatment and disposal of infections waste are also considered in this part. Upto some external waste treatment and mainly the first two options; waste avoidance and waste recycling, comprise the techniques that are commonly termed as waste minimization. Any action taken to reduce the toxicity and volume of waste, in its broadest sense, is termed as waste minimization. Certain forms of waste treatment, waste avoidance, recovery, waste recycling and utilization is all included in waste management. Technologies as incineration, chemical detoxification and biological treatment of waste can lead to a major decrease in the toxicity and volume and thus a minimization of the pollution potential of waste when disposed off, e.g. by landfilling. Waste reduction at source and recycling have been emphasised here. 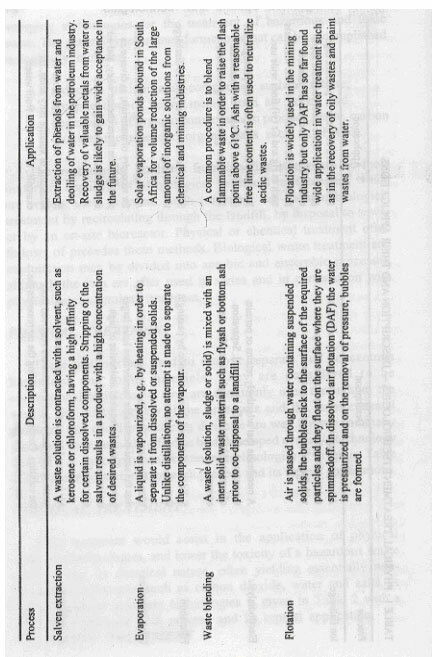 Given below are some appropriate definitions given by the United States Environmental Protection Agency (US EPA). Reduction at source. Any activity that reduces or eliminates the generation of hazardous waste at source, usually within a process. Recycling. A material is recycled if it is used, reused or reclaimed. A material is used or refused if it is either (i) employed in a particular function as an effective substitute for commercial product. A material is reclaimed if it is processed to recover a useful product or if it is regenerated. Examples include the recovery of lead values from spent batteries and the regeneration of spent solvents, or (ii) employed as an ingredient (including its use as an intermediate) to make a product (however, a material will not satisfy this condition if distinct components of the material are covered as separate end products e.g., when metals are recovered from metal containing secondary materials. Waste minimization. This includes any source reduction or recycling activity undertaken by the generation that results in either (i) the reduction of toxicity of the hazardous waste, or both, so long as such reduction is consistent with the goal of minimizing present and future threats to human health and the environment or (ii) the reduction in the total volume or quantity of hazardous waste. 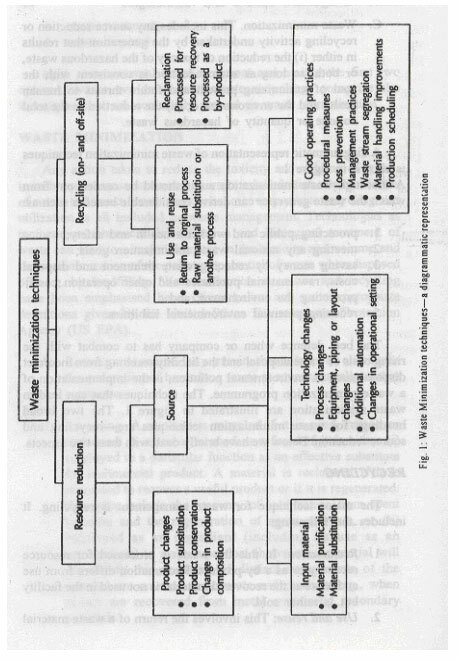 A diagrammatic representation of waste minimization techniques is shown in figure 1. The best defence when or company has to combat with the rising costs of waste disposal and the liability resulting from incorrect disposal such as environmental pollution, is the implementation of a waste minimization programme. The techniques that can lead to waste minimization are illustrated in Figure 1. The two broad headings for waste minimization techniques are-recycling and source reduction. Below we have briefly dealt with these two aspects. Reclamation: In this the waste is processed for resource recovery or as a by-product. Reclamation differs from use and reuse as the recovered material is not used in the facility but is rather sold. Use and reuse: This involves the return of a waste material either to the originating process as a substitute for an input material or to another process as an input material. Location since the high cost of transport can make recycling very uneconomic. In-depth audit: A thorough investigation of the processing and manufacturing facility. Commonsense audit: The most obvious areas for minimizing the waste produced are attended to. This is easily accomplished in a short time and can also lead to substantial savings. R & D audit: Considerable time and funds are spent researching new approaches to waste minimization. Information based audit: Information that can lead to the minimization of the waste can be obtained cheaply from waste management companies, consultants or from the literature. The production personnel should be highly motivated to implement and maintain the necessary changes; and the technologies used must be elegant in their simplicity itself. Economic information- Waste treatment and disposal costs, product, utility and raw material costs, operating and maintenance costs and departmental costs accounting reports. Design information -Process flow diagrams, materials and heat balances (both design balances and actual balances) for (i) pollution control processes, operating manuals and process descriptions, equipment lists, equipment specifications and data sheets, piping and instrument diagrams, plot and evaluation plans, equipment layout and work flow diagrams. Raw material/production information- Product composition and batch sheets, material application diagrams, material safety data sheets, product and raw material inventory records, operator data logs, operating procedures and production schedules. Environmental information- Waste analyses, environmental audit reports, hazardous waste manifestos, emission inventories and permits and/or permit applications. Other information- Chemical characteristics, cost effectiveness of treatment and disposal options, company environmental policy statements, siting of treatment and disposal facilities, standard procedures, organisation charts, effluent and residue quality standards and the chemical characteristics; namely, corrosiveness ignitability and reactivity. waste segregation to reduce the volume of hazardous waste by preventing the mixing of hazardous and non-hazardous wastes. These also include the methods of source reduction by changing the technology employed for it. In the existing plants, the process changes are made on a continuous basis in order to increase production efficiency, to reduce manufacturing costs and to make product improvement; but the primary goal is usually not hazardous waste minimization. As hazardous waste management costs increases day by day, the need for cost management is definitely expected to increase. Examples of process changes might be as drastic as replacing the mercury cell in the chloroalkali industry with a diaphragm or membrane all to avoid the production of a mercury waste and mercury containing effluent or as simple as replacing a chemical cleaning bath with mechanical cleaning in the metal finishing industry. The next approach to source reduction is to make input material changes, either by substitution or purification. A starting material of higher purity can lead to a considerable decrease in waste production. The substitution of a higher toxic material by a material of lower toxicity, e.g. cyanide in the electroplating industry by the considerably less toxic cyanate, leads to a substantial reduction in the toxicity of the wastes produced in the process. Another approach to source reduction is to make product changes with the express intent of reducing the quantity of hazardous waste produced during the manufacturing process and on the disposal of the product at the end of its useful life. The increasing use of the water-based explosives is a very good example of product change. It not only culminates the problem of disposal of wastes containing hazardous substances like nitroglycerine but also minimizes the need for the use of organic solvents in the manufacturing process. The replacement of the highly toxic polychlorinated biphenyl (PCB) - containing oil in transformers with other oils or even using air--cooled transformers is a highly topical example of the problems posed by the need to dispose of a worn-out piece of equipment. Nature of the hazardous toxic waste concentrating on (i) the hazard posed by waste criteria such as mammalian acute toxicity, mutagenic, teratogenic, carcinogenic, ecotoxicity and environmental fate, both accumulation and persistence. Commitment to IWM and waste minimization. The number of treatment and disposal technologies available is enormous and the variations on these technologies to be found in the literature are only limited by the ingenuity of scientists, engineers, technologists and the nature of the problem. Since the middle of 197s when in Europe and USA, the environment as an issue received more attention, considerable advances have been made in the disposal and treatment of toxic and hazardous waste. A plethora of methods and potential applications will be revealed if we have a brief look at the literature while selecting an appropriate technology, a considerable care must be exercised because many of these methods are unproven, speculative, or at best still emerging technologies whose worth will be proved only in the long run. The disposal and treatment of toxic and hazardous waste can be generally classified as following. In order to minimize its impact on flora and fauna, the general environment and human beings, any waste treatment technology should destroy the waste or at least reduce the toxicity of the harmful components. Most treatment technologies can be read adopted and modified to the requirements of a particular waste stream. It is form of disposal in which the final state of the waste is mediated by microbial intervention. Some of the most important points of this treatment for easy reference and completeness have been summarized. There is a large biological component to land-filling and land treatment. Here we will discuss with those applications in which a carefully selected and controlled form of biological activity is the central process of the hazardous waste treatment. Normally, biological treatment of predominantly aqueous wastes is accomplished in specially designed bioreactors. A suitable culture of the microorganism or microbial association, either aerobic or anaerobic is chosen. Enrichment, isolation and genetic manipulation are making it possible to obviate post failures of treatment systems which were inoculated with non-specific microbial associations. degradation of organic compounds to produce waste, carbon dioxide, methane and organic salts such as phenols. The treatment of leachates from landfills is one of the most important applications of biological treatment technologies, which are widely used overseas. Such treatment can include biological treatment by recirculating through the landfill, by disposal to sewer or by an on-site bioreactor. Physical or chemical treatment often follows of precedes these methods. Biological waste treatment and exploitation may be divided into aerobic and anaerobic processes, although the two are after used in series and in conjunction with physical and chemical treatment. These methods are used to remove separate and concentrate hazardous and toxic materials. They are considered to be conventional technologies and are commonly used throughout the world. The safety aspects of the processes and the environmental problems that could arise during their use are well known and many processes have been identified as best developed available technology (BDAT). 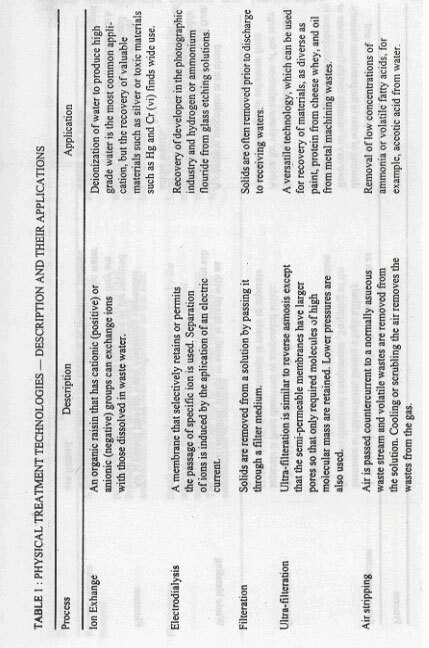 A list of physical treatment technologies is given in Table 1 with a brief description of each process and its typical applications. This treatment would assist in the application of physical treatment technologies, and lower the toxicity of a hazardous waste by changing its chemical nature, often yielding essentially non-hazardous substances such as carbon dioxide, water and salts. 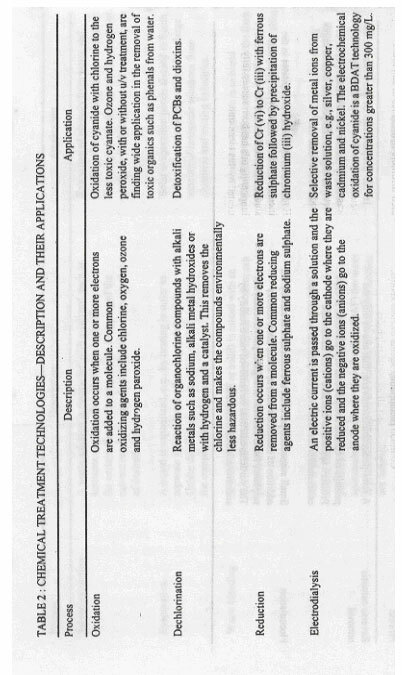 A list of chemical treatment technologies is given in Table 2 with a brief description of each process and its typical application. Anaerobic decomposition involves the breakdown of organic wastes to carbon dioxide and methane in the absence of oxygen. The process kinetics and material balances are similar to aerobic processes though there are certain basic differences. Since little energy is yielded by the conversion of organic acids to methane gas; the rate of growth and the yield of organisms are low and thus the rate of organic removal and the sludge yield are also considerably less. High process efficiency requires elevated temperature, although the methane gas produced can be used to provide this heat. One advantage of anaerobic treatment is methane which can be used as a valuable source of energy or even as a chemical feed stock, e.g., in the production of cyanide. In the treatment of food and brewery wastes, anaerobic technology has found ready application. It has also been shown that a variety of aromatic compounds can also be broken down by anaerobic methods. Organics + Oxygen + N + P ? New cells + Carbon dioxide + water + non biodegradable residue. Cell + Oxygen ? Carbon dioxide + water + N + P + non-biodegradable cellular residue. Many times industrial waste waters are discharged to sewers and thus get treated at the municipal sewage works at an activated sludge plant. Since the BOD consists of predominantly suspended and colloidal matter with only 40% of it being soluble, when we compare the municipal waste water and industrial waste water, as the latter has BOD which is 100% soluble. The biodegradability of industrial organics is often much lower and they can also be toxic to the biomass, for example, phenolic compounds. The efficient and sludge quality will also be effected. The tendency is there for the erection of dedicated plants, although discharge of industrial effluent to sewer will continue to be a potentially viable option. At the same time, it must be noted that the effective biological treatment of hazardous wastes and effluents need not involve the use of expensive plant since typical treatment systems include aerated lagoons, trickling filters and even oxidation ditches. Other common treatment systems include the rotating biological contactor, activated sludge reactors and fluidized bed reactors. The disposal of hazardous and toxic wastes, after appropriate treatment, to landfills is the most common method of disposal and is likely to remain so in the foreseeable future. In future, it is expected in general that the standards for landfilling will increase as knowledge of technology improves because of the risk of pollution posed by the practice of landfilling. The current trend overseas is to minimize the disposal of many organic wastes to landfills, although our knowledge of technologies such as co-disposal is increasing in many countries. Encapsulation and burial in deep sea sediments. Discharge using a submarine pipeline. Dumping from vessel and barges. to achieve a high initial dilution of the discharge effluent. There are many examples of the wastes that are currently being disposed by this technology. They include begnin wastes from pulp and paper industry and neutralized phosphogyprum from the fertilizer industry. The International Convention on the prevention of marine pollution by dumping of wastes and other matter (1975), commonly known as the London Convention, has listed (black list or Annex 1) highly hazardous substances that are prohibited from dumping. Mercury, cadmium, organohalogens and their compounds are included in the list of familiar materials. This list also includes persistent plastics, radioactive wastes, crude oil and its wastes. The grey list or Annex 2 gives compounds that can be dumped on issue of a special permit. Due to many misconceptions and past misuse, marine disposal has met with wide public disapproval throughout the world and because of the above listed reasons, its use is declining rapidly. Incineration is the most common form of thermal treatment of hazardous and toxic wastes. Technologies such as paralysis and sterilization, which can be included in thermal treatment which further involves the degradation of organic material, usually in the complete absence of oxygen and wet air oxidation, which is a form of chemical oxidation. Incineration is the controlled combustion of waste materials to a non-combustible residue or ash and exhaust gases which are carbon dioxide and water. The combustion of wastes containing sulphur and chlorine can lead to considerable quantities of acid gases such as sulphur dioxide and hydrochloric acid, but these can be scrubbed from the gas tream prior to discharge to the atmosphere. The nature and form of the furnace to be incinerated, determines the choice of the furnace. However, the fluidized bed furnaces, rotary kiln and multiple hearth have been shown to be the most versatile for mixed or general hazardous waste streams. The burning of hazardous and other wastes as fuels in cement-kilns, is one of the most important innovation of incineration. Normally, very high temperature (up to 1250?C) is required by the hazardous waste and for complete combustion of thermally stable materials such as PCBs, a very long residence time Cone or two seconds) is required. Rapid quenching of the blue gases is often required in order to prevent recombination of the gases into the highly thermodynamically stable dioxins. can not be safely disposed of in a landfill site. the long gas residence times (up to six seconds). Since these facilities are already existing, there is often less public opposition to their siting, and Capex required is only 10% of that needed to build a dedicated chemical incinerator. At present, there are over 25 cement facilities in USA burning more than one million tonnes of hazardous waste fuels per year. The disadvantage of this is that only limited amounts of certain hazardous constituents can be added, for example, sulphur, heavy metals and chlorine etc. ; due to their effect on the operation of the kiln or the quality of the clinker. The fact that the waste should preferably have a calorific value and the increase in costs of monitoring the stock gases, make pretreatment often very necessary. However, it is clear that the emissions from cement kilns burning hazardous waste fuels pose no hazard to human health or the environment. Types and refuse derived fuels are the other wastes that are burned to make them non-hazardous for the environment and for the benefit of mankind. Land treatment of wastes is a form of disposal in which the final state of the waste is mediated by intimate contact with the soil. Conventional farming technology is creatively adopted to dilute and to chemically or biologically inactivate solid and liquid wastes over relatively large areas of land. Lined cells containing appropriate soil is however utilized under special conditions. The principle is that land treatment exploits the natural capacity of the soil to return substances to a condition approaching the original state from which they were won by a process of extraction and purification. In theory, almost all wastes can be treated by land treatment, though our knowledge of the mechanisms of attenuation, biological degradation and dispersal is extremely limited. In planning, a land treatment facility, a large number of factors need to be considered, including the climate, soil type, topography, geology and the infilteration along with run-off potential of the soil. Provision for diversion of the runoff that would be generated both in normal and abnormal weather conditions must be made. To ensure that the waste can be successfully treated and a very strict monitoring programme must be instituted, there is a need for trials to be conducted. All this must be maintained throughout the life of the site in order to ensure that the treatment remains successful and pollution does not occur. The technique has proved very useful for rehabilitation of land contaminated, particularly by petroleum wastes. Land treatment is often a very cheap method for the disposal of wastes but in general it is not favoured because of the high pollution potential of the technology. The choice of a process for the clean-up and strategy along with rehabilitation of a site should be done on the basis of a detailed risk assessment that includes a hazard evaluation, exposure assessment and risk characterization. The most obvious source of pollution should be first on the list as per priority basis, e.g., old drums and stockpiles as well as obviously contaminated soils and to contain potential run-off water on-site in order to minimize further pollution. Disposal of the removed materials should be only to a permitted landfill after appropriate treatment, which could include incineration. Once this stage is over, the long and often arduous task of assessment of the extent of the pollution and choice of rehabilitation strategy must take place. After an extensive investigation on the site, the rehabilitation strategy should be decided. This could also include the analysis of soils, both on and off-site, from trenches and the analysis of surface water, and groundwater from existing and specifically drilled boreholes. In the order of importance, the most common technologies used in USA during 1987 were: engineering containment, incineration or other thermal treatment, solidification/neutralization/ stabilization, volatilization or soil aeration; bio-treatment and vacuum extraction. The main aim of engineering containment is to limit the movement of surface or ground water into the contaminated area or prevent contaminant nitration from the site. Options include the provision of covers as far site closure or vertical barriers by slurry trenching or cut-off or diaphragm wall technology. The other treatment technologies are simply variations of those described in the earlier sections. Two treatment technologies-volatilization and bioremediation are discussed below. This method is also called soil venting method. It has proven to be highly effective for the removal of volatile compounds from soil by using commercial units that heat up the soil to between 100 and 500Â°C. Even PCBs have been removed in rotary dryers at a temperature of 350 to 550Â°C. Soil venting or aeration can be either passive as when pipes are put in the ground to allow landfill gas to escape or active as when air is pumped into the soil or a vacuum applied. The resulting gas stream in all these methods has to be treated in order to remove the contaminants. The resulting waste must then be subjected to further treatment, if necessary, before sending it for final disposal. levels of macro phosphate, nitrogen and micro-nutrients, e.g., zinc, magnesium etc. Solidification or cementation is a process in which the waste is converted to an insoluble rock-like material by mixing with suitable materials to form a solid product. Encapsulation is the coating or enclosure of waste with an inert durable material. Micro-encapsulation is applied to the individual particles of a waste, while macro-encapsulation is the encapsulation of a mass of waste in a container. Immobilization or chemical stabilization is a process in which the waste is converted to a more chemically stable or more insoluble or immobile form. Cementing agents such as lime, flyash, gypsum mixtures and hartland cements are the most common materials used in the above mentioned technologies. Although they are highly successful in reducing the mobility of wastes, cementation methods often lead to a considerable increase in volume, e.g., the solidification of 40 litres of radioactive waste can increase the volume to as much as 100 litres, thus considerably increasing the cost of both transport and disposal. However, recently many new products based on heat-treated natural clays have recently become available. These are capable of absorbing liquid wastes and sludges, either organic or inorganic, to produce certain products that easily pass normal leachability tests. With the help of these products there is only 20% increase in volume which is really observed. There are certain often materials which are used in a process called verification (but this has largely been applied to radioactive wastes). These materials are: styrene divinylbenze copolymers, glass materials, and bitumen, polymers such as polyethylene. It becomes very clear that these types of processes, which would greatly reduce the mobility of wastes in a landfill, should be playing a much more important role in the disposal of wastes to landfill. Wastes with relatively high concentrations of hazardous materials could be immobilized and, therefore, disposed as a waste with a much lower pollution potential. The leachability test devised by the US EPA is called the toxicity characteristic leaching procedure (TCLP) in which acetic acid or acetate buffer is used to leach the treated material. Solidified products which pass the test, for example, which give a leachate concentration below a specific lower limit, are considered to be non-hazardous. Typical wastes containing mercury, arsenic and even quantities of high hazard pesticides can be successfully treated with this procedure. The use of solidification process can greatly reduce the effective concentration of waste disposed to a site and thus, could be used to limit the amount of macro-encapsulation in specially designed cells of a variety of both inorganic, e.g., arsenic and organic wastes, e.g., pesticides and/or PCBs that are contained in sealed drums of 210 litres capacity. The cell is constructed within an appropriate containment landfill and is designed to minimize the potential leakage of wastes from the cell and is of such a size that damage due to earth movement or earthquakes is likely to be minimal. Even if the technology is available, macro-encapsulation of inorganics will always have an important role to play but it is preferable to incinerate organics rather than encapsulate them. In fact, the truth has to be emphasised that we are leaving a legacy for our inheritants in the form of a storage technology known as macro-encapsulation. Except for incineration, most of the technologies cited above do not greatly reduce the volume and not even in all the cases. There is mostly some material left behind which must be land-filled. In the case of incineration, the waste is, however, reduced to its 10% of the original volume and syringes and needles are rendered unusable. Thus in many countries, incineratian is preferred, although public concerns about the possibility of air pollution from the incinerators have led to increased costs for appropriate pollution control measures. For the handling of infectious waste, these are a number of innovative systems that have been recently developed. In one of these, two containers are used to dispose of infectious waste products. The most effective one is a moulded polypropylane container with a slot in the top. This container is always available at the operating table or in the ward to drop in contaminated instruments, needles and syringes. For wastes such as placentas, dressings or swabs, a large cardboard box lined with a red garbage style bag is used. Both containers are marked with the universal bio-hazardous symbol. The wastes are transported in specially designed and distinctive vehicles to a centralized incineration facility. After weighing, the boxes are incinerated in a dual chamber incinerator. The boxes containing the hazardous waste are ram-fed into the first chamber where they are burnt at a temperature of around 800Â°C in a slight stoichiometric deficit of oxygen. The gas which contains small amounts of paralysis products, is burnt in the second chamber at 900Â°C in a stoichiometric excess of air. Diesel is used to supplement the fuel requirements of the incinerator. Experience has shown that the stack emissions readily conform to existing atmospheric pollution regulations including the USA standards set by the EPA. The need for an experienced and skilled operator can not be emphasized strongly enough in order to achieve such results.